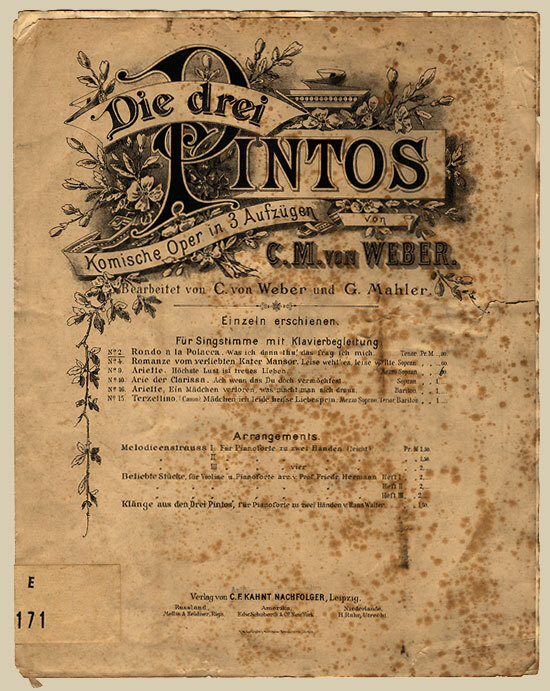 Die drei Pintos (The Three Pintos) is a comic opera in three acts left unfinished by Carl Maria von Weber and completed by Gustav Mahler. The libretto was written by Theodor Hell, based on Carl Seidel’s story Der Brautkampf (The bride's struggle). Mahler finished the work in 1887 with its first performance taking place the following year in Leipzig 20th January 1888. The Three Pintos was an immediate success and was soon performed in cities all over Europe raising Mahler’s profile and establishing him as a serious composer. 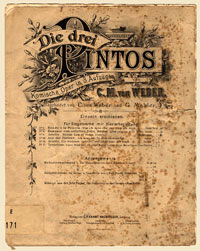 The cover from an old manuscript of 'Die drei Pintos'. Weber began composing The Three Pintos in 1820, but the project was soon sidelined in 1821 when he committed to completing the following three commissions: Preciosa, Euryanthe and Oberon. 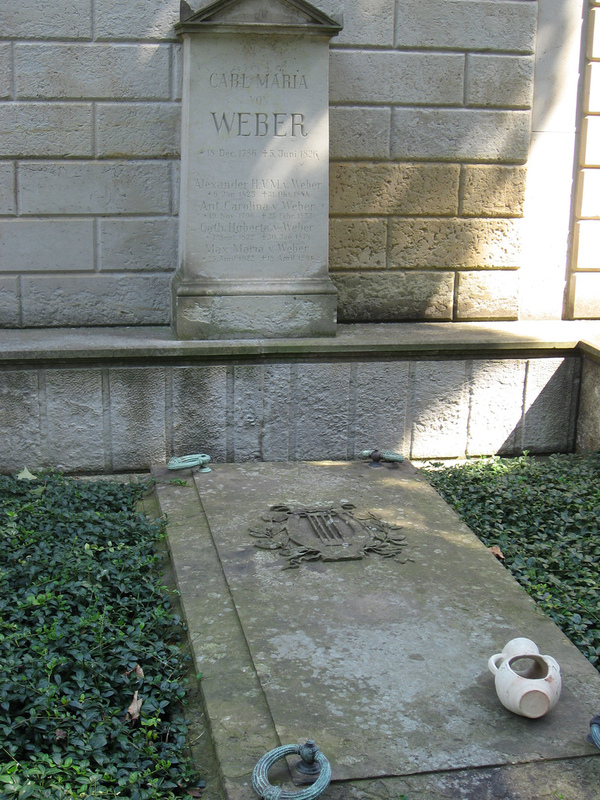 Weber died in 1826, leaving the opera unfinished. Weber had written sketches for 7 out of the 17 intended numbers totaling 1700 bars of music, of which only 18 were scored. Weber’s family gave the sketches to the noted German opera composer Giacomo Meyerbeer to complete, however, after 26 years Meyerbeer returned the sketches untouched in 1852. Weber’s son Max attempted to seek out a willing composer to finish the opera to no avail. It was the composer’s grandson, also named Carl von Weber, who succeeded in persuading the 26 year old Gustav Mahler to take up the mammoth project in 1887. At this time, Mahler was second conductor at the Leipzig Stadttheater. He often visited the Webers’ residence becoming a close family friend where a complicated romantic entanglement developed between Mahler and Carl’s wife Marion von Weber. The deep infatuation and heartache caused by this short lived affair supplied Mahler the inspiration for the inception the First Symphony and the first movement of his Second Symphony entitled ‘Todtenfeier’. Mahler wrote to friend Natalie Bauer-Lechner: "the musical, radiant presence of his [Carl’s] wife, her mind constantly turned to the highest things, gave new substance to my life. Their charming children, too, were very deeply and warmly attached to me, as I to them, so that we were happily devoted to one another." To complete the opera, Mahler went through a laborious process which included: transcribing the draft sketches, gathering additional material from minor works of Carl von Weber’s, composing 13 numbers himself based on Weber’s themes and leitmotifs in which he exhibits fine musical taste with an expert sense of theatre (notably the entr’acte preceding Act 2 and the two part finale of Act III), instrumentalising the work in accordance with Weber’s style, all of which resulted in a remarkable example of posthumous collaboration. Indeed, Richard Strauss wrote in a letter from 1887 to his mentor Hans von Bülow: "Mahler’s arrangement of Weber’s ‘Three Pintos’ seems to me to be a masterpiece." The resting place of composer Carl Maria von Weber. The premiere, conducted by Mahler, took place on January 20 1888 in front of an influential audience including composers Richard Strauss, Pyotr Tchaikovsky, and the heads of various international opera houses looking to acquire rights to perform the work. Indeed, the opera soon went on to be performed in Hamburg, Munich, Dresden, Kassel and Vienna. These productions helped bring Mahler’s name into prominence in the European music press, also earning him large financial rewards. Don Gaston Viratos, former student of Salamanca, is taking leave of his friends before leaving for Madrid, where he is to become a government official and hopes to find a bride. lnez, daughter of the innkeeper with whom the farewell is being celebrated, tells him as a warning of the ”romance of the lovesick cat Mansor," the song of a faithless lover who despite burning lover's oaths, leaves his Zaide in the lurch. Don Pinto de Fonseca, a fat, foolish country squire appears: he is on his way from Castilia to Madrid to marry the wealthy Donna Clarissa. The marriage has been arranged between the two fathers and he is worried about his meeting with the girl, whom he has never met: how does one woo ones future wife? Gaston teaches the hopelessly untalented man all the arts of the fiery lover, his servant Ambrosio having to play the part of the affected bride. When Pinto, now exhausted, turns to food and drink, Gaston decides to save the unknown beautiful girl from this uncouth wooer: he makes Pinto drunk and takes from him the letter promising marriage. To the amusement of the guests Gaston and Ambrosio put the sleeping Don Pinto to bed so that he can sleep off his drunkenness and they can proceed undisturbed for Madrid on their marriage adventure. Don Pantaleone Roiz de Pacheco has assembled all his servants and they are wondering what the reason is. He then appears himself and announces the imminent marriage of his daughter Clarissa to the son of his friend. Don Pinto. In the general joy which ensues nobody notices Clarissa's despair: she loves Don Gomez de Freiros and wants to marry no other. So far her love has had to be kept secret because Gomez was forced to hide following a duel. Laura, her servant, consoles and encourages her. She brings Gomez to the house secretly: he is firmly determined to defend his love and to drive away thesuitor with his sword. Laura and the servants are decorating the festival ball in Don Pantaleone's palace for the wedding. Gaston and Ambrosio enter unseen and discover Laura, whom Ambrosio succeeds in winning for himself. Gomez comes across Gaston, whom he inevitably takes to be Don Pinto and reveals to him his love for Clarissa. The false Don Pinto insists upon the rights of the (stolen) promise to marry and challenges Clarissa’s lover to a duel. Gomez, anxious to avoid any insult, offers him satisfaction: “O lend your ears to better strain, grant me what to me inclines, the greatest good I seek remains: Clarissa's love and marriages lines!'' Pinto-Gaston generously releases the girl before Pantaleone's people come to greet the bridegroom - "Which one is it? This one? No, the other!" Pantaleone is just bringing in the festively dressed bride when the real Don Pinto, “ponderous and puffed up." enters the hall. Nobody believes his assurances that he is the real Don Pinto de Fonseca, and when he even makes an unsuccessful attempt to show his bride the arts of wooing learned from the student Gaston, he is ridiculed and scolded. He then notices Gaston and rushes at him so full of anger that the latter has to threaten him with his sword. Don Pinto is thrown out, Gaston and Ambrosio are satisfied with the outcome of their adventure and nothing now stands in the way of the marriage between Clarissa and Gomez. Werner Hollweg, Hermann Prey, Lucia Popp et al., Munich Philharmonic Orchestra conductor Gary Bertini (studio recording, RCA, 1976). Gunnar Gudbjörnsson, Alessandro Svab, Barbara Zechmeister et al., Wexford Festival Opera Chorus, National Philharmonic Orchestra of Belarus, conductor Paolo Arrivabeni (live performance, Naxos, 2004). Peter Franklin. "Mahler, Gustav." In Grove Music Online. Oxford Music Online, http://www.oxfordmusiconline.com/subscriber/article/grove/music/40696 (accessed June 16, 2012). Clive Brown. "Drei Pintos, Die." In The New Grove Dictionary of Opera, edited by Stanley Sadie. Grove Music Online. Oxford Music Online, http://www.oxfordmusiconline.com/subscriber/article/grove/music/O004089 (accessed June 16, 2012).